Computational fluid dynamics (CFD) has long played a role in product development by providing a virtual laboratory in which users are able to investigate “what if” scenarios with their designs. This has typically been a one-off approach in which a user creates an input file to represent their product design and then simulates it to understand the product’s performance. A setup typically includes geometry, material properties, and flow conditions such as mass flow rates, boundary temperatures and pressures, and output frequency. Based on the resulting information learned from the simulation, various inputs may be modified and the simulation is restarted to investigate more “what if” scenarios. This approach to simulation can be thought of as “what if – then do this” which is similar to closed-loop control. A new feature in FLOW-3D v11.1 and FLOW-3D Cast v4.1 called Active Simulation Control provides users with an impressive level of “what if – then do this” control over their simulations. Active simulation control is based on two concepts – events/conditions and actions. Below is a brief description of each. When the specified conditions are met, an event occurs and all actions associated with it are activated. When an event occurs, all actions assigned to it are activated. Shot plunger transition to fast shot: The initial motion of shot plungers in high pressure die casting machines is controlled to minimize air entrainment. For example, once metal reaches the gates, the shot motion transitions to a fast shot to atomize the metal in the part. Active simulation control can be used to detect when metal has reached any or all of the gates and change the plunger motion accordingly. Gravity castings often employ a pouring basin to allow a constant pressure head to be maintained over the sprue. Active simulation control can be used to control the pouring into the basin based on the fluid height in the basin. Control gates are commonly used in fish passages through dam structures to limit the flow velocity to ranges acceptable to fish. Active simulation control can be used to move the gates based on velocity information at probes located in fish resting areas. The pressure in cryogenic fuel tanks must be maintained at design levels to ensure proper operation and safety. If the net pressure suction head drops below acceptable levels, cavitation will occur in the engines and the vehicle may be destroyed. Active simulation control can be used to simulate pressurization (mass momentum source) and depressurization (valve opening) of the system in response to a pressure (history probe) loss in the vapor space. Active simulation control can be applied to a mixing simulation to control filling on/off, and mixer motion (see below). A retracting filler tube is used to fill the container with a fluid containing marker dye. A paddle mixer is lowered into the container when filling is complete. A probe is attached to the filler tube to detect its position. Another probe is attached to the bottom of the mixer to detect its position. 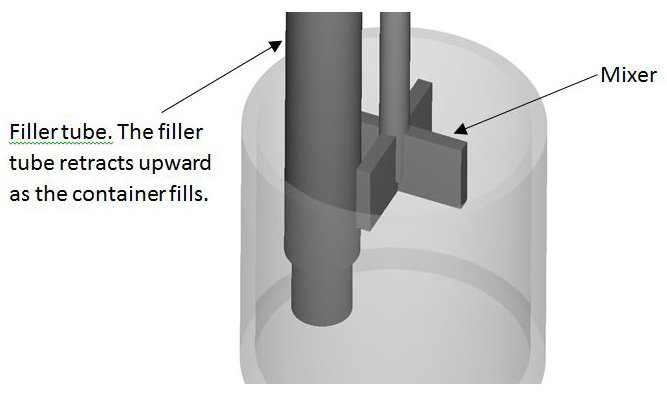 When the filler tube is raised above a specified level, the mixing impeller begins to lower into the fluid. When the mixer reaches a specified level, it begins to rotate. When the mixer reaches a point just above the bottom of the container, it stops moving down but continues to rotate. The animation below shows dye concentration in the fluid as the container is filled and then mixed. 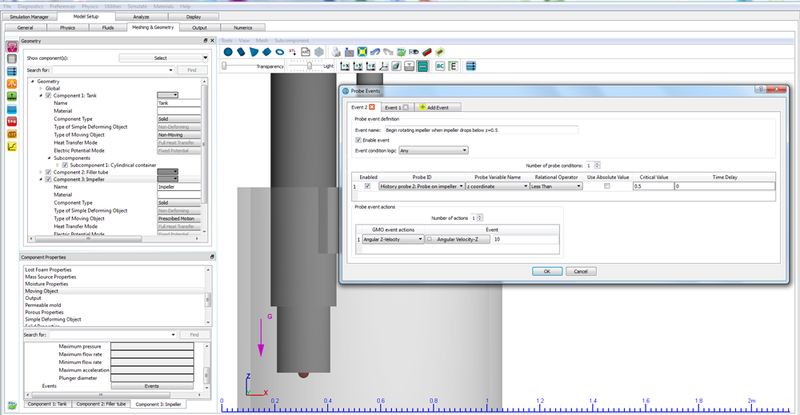 The mixing example shown here offers a peek into the broad functionalities provided by active simulation control. With active simulation control, users are able to more closely represent the actual behavior of their designs and implement changes to their simulations actively without restarting them.